If surprise was the focus of the event, we'd say the Samsung Android-powered, Verizon-exclusive (and, alas, Bing-driven) Continuum reveal was a comedy of errors -- but who cares now that we've got our hands on the Galaxy S phone, secondary ticker and all (at 480 x 96 resolution). 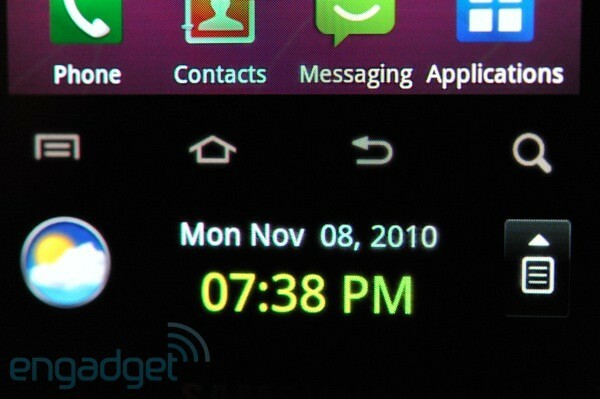 The Android buttons themselves, as it turns out, are on the display as well -- basically, it's one huge display. The grip sensor that activates the display seems to work well, although it's pretty easy to squeeze the camera button by accident since it's also on the lower right of the phone. Unfortunately, there's no way for third-party apps to update the ticker -- it's limited to Samsung's stuff right now. We're trying to get some battery life info -- we're curious if turning on a smaller screen more often will result in a longer shelf life, or if it'll just be about even. Update 2: Okay, we got some more info on that screen. The entire front of the phone is one huge four-inch screen, with the Android buttons more or less painted over the lower third -- the screen lights up underneath them in white to illuminate them. Samsung says it's just easier for marketing purposes to say it's two screens, but that they're selectively turning on the bottom portion of the display for the ticker. As far as battery life, it's a 1500mah battery that'll last about a day, we're told -- the lower screen turns on whenever a notification comes in, but since it's a smaller screen the battery life is on par with the Fascinate. Update 3: Added a quick macro pic of the buttons after the break -- you can see how it's just one big screen. We also took some side-by-sides with a Captivate -- the Continuum is thicker and narrower. Samsung says the narrower size is designed to appeal to women, who generally have smaller hands.